The crowd, while mostly Catholic, also included a number of Protestants, Evangelicals and some Muslims. 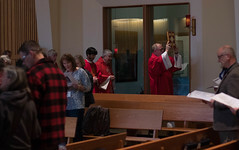 The cardinal archbishop of New York told the standing room only crowd that the Cathlic Church must strengthen traditional families, which are the very foundation of culture and church. He also said there must be a restoration of the luster and appeal of the church so that those who have drifted or left might consider a return to their spiritual home. Lastly, he cautioned that the church is in the midst of a struggle with an increasingly hostile American culture that is encroaching on religious liberties. While optimistic that Americans will ultimately fall on the side of religious freedom, Cardinal Dolan said the church and believers must be vigilant in defending the right to freely practice their religion. Fairbanks Catholic radio station, KQHE 92.7 FM, broadcast and live streamed the entire talk and Q&A session immediately following. 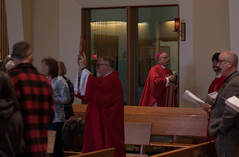 The station also covered the Solemn Vespers liturgy with Cardinal Dolan at Our Lady of Guadalupe on March 25 as well as the March 26 Mass and homily by Cardinal Dolan at Our Lady of Guadalupe. 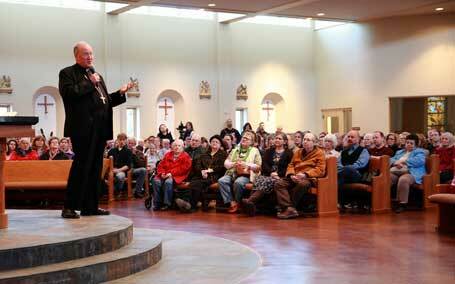 Cardinal Dolan, one of the biggest names in the U.S. Catholic Church was in Anchorage for four days to speak at the annual Alaskan Priests Convocation, which includes priests from all three Alaska dioceses — Anchorage, Fairbanks and Juneau.